Jeremy Pepper, is director of communications, at The Point, an online community that helps individuals organize efficient group action, leveraging the power of the Web to solve problems and be a catalyst for change. Jeremy is responsible for traditional and social media programs, as well as community outreach and marketing. He has a decade’s worth of experience in high-technology, consumer technology and consumer public relations, and is one of the world’s earliest and well-known PR bloggers and social media strategists. His POP! PR Jots is one of the most popular PR blogs, writing on topics affecting the marketing and public relations industries. Prior to The Point, Jeremy worked at Weber Shandwick with clients across the board on the development of social media campaigns and strategies; such companies included Cisco, BEA Systems, General Motors, MasterCard International, Verizon Wireless and VeriSign. Prior to joining Weber Shandwick, Jeremy founded POP! Public Relations in Scottsdale, AZ, worked in-house as Public Relations Manager at Ofoto, and at Shandwick International on the Eastman Kodak and Compaq teams. Jeremy’s past public relations campaigns have won the IPRA/United Nations Grand Award for outstanding achievement, the IPRA Golden Award and two Silver Anvil Awards of Excellence. I’ll be having a live discussion with Jeremy about Jeremy, The Point, and the public relations industry. Don’t miss it or we just might change the world without your input. 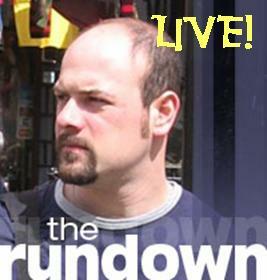 The Rundown airs on many Tuesdays at 1:30pm Eastern. It’s live, so just call in at (646) 716-8329. You can also email your text or audio comments to me before the show and I’ll fit them in. The archives will be available at my BlogTalkRadio host page or by subscribing to the show’s RSS feed. You can also subscribe to the show on iTunes. Also, I am the PR Coordinator for BlogTalkRadio.